This archive of recipes that use coffee as an ingredient began life in mid-2006 on the defunct Companion to the Old Foodie site. Rather belatedly I am bringing it into its new home, and intend to add to it again from time to time. To read the original dedication and the comments, please go HERE. 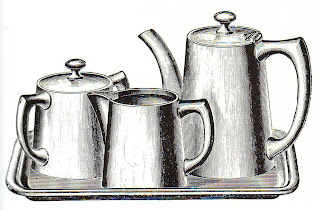 Gaufres au Caffé. With Coffee. To a common Table Spoonful of grounded Coffee, put a Quarter of a Pound of Sugar-powder, a Quarter of a Pound of fine Flour; mix it well with good thick Cream as the preceding*; you may also put a little Salt to either. Des Cornets: they are done with the same preparation as the first or second, only a little more Liquid; as soon as you take them out of the Iron, twist them to what Shape you please; they will remain so in cooling. *as the preceding … the Paste being prepared after this Manner … warm the Gaufer-iron on both Sides, and rub it over with some Butter tied in a Linen-bag, or a Bit of Virgin-wax; put a Spoonful of the Batter, and bake over a smart Fire, turning the Iron once or twice, until the Gaufer is done on both Sides of a fine brown Colour; if you would have them teisted, put them upon a Mould ready at hand for that Purpose; put it up directly as you take it out, and press it to the Shape of whatever Form you please, and so continue always; keep them in a warm Place. From "The practice of modern cookery; adapted to families of distinction, as well as to those of the middling ranks of life. …; " George Dalrymple; published in Edinburgh in 1781. Mix a little flour with a pint of cream, and chocolate in proportion, a little sugar, and four eggs; boil it about a quarter of an hour, stirring it continually for fear it should catch at bottom; then put it in the paste, and the whites of four eggs beat to a snow upon it; glaze it with sugar, and bake it. N.B. Coffee-pie is made after the same manner, boiling two or three dishes of clear coffee with the cream instead of the chocolate, as the preceding; they are both to be done without top-crusts. Mix four cups of good coffee, with three half-pints of cream, and sugar according to teaste; boil it together, and reduce it about one third; then add the yolks of eight eggs beat up, mix it very well, and bake as the preceding*. N.B. Observe, that the coffee must be done as if it was for drinking alone, and settled very clear. Oeufs au Caffé. Coffee Eggs. Make some good coffee, let it stand so clear as usual, and sweeten it according to taste; beat up the yolks of eight eggs with four or five cups of coffee, and strain it; pour this in little moulds in form of eggs; do not fill them quite full, and bake in a slow oven. You may also make them after this manner, in shape of any fruits, or birds, if you have proper moulds, then they take the name accordingly. Divide a quart of stiff flummery into three parts, and make one part a pretty thick colour with a little cochineal bruised fine, and steeped in French brandy. Scrape an ounce of chocolate very fine, dissolve it in a little strong coffee, and mix it with another part of your flummery to make it a light stone colour. The last part must be white. Then wet your temple mould, and fit it in a pot to stand even. Fill the top of the temple with red flummery for the steps, and the four points with white. Then fill up with chocolate flummery and let it stand till the next day. Then loosen it round with a pin, and shake it loose very gently; but do not dip your mould in warm water, as that would take off the gloss and spoil the colour. When you turn it out, stick a small sprig of flowers, down from the top of every point, which will not only strengthen it but also give it a pretty appearance. Lay round it rock candy sweetmeats. Beat half an ounce of isinglass fine, put to it a quart of cream, and mix them well together. Let it boil softly over a slow fire for a quarter of an hour, and keep stirring it all the time. Then take it off, sweeten it to your taste, and put in a spoonful of rose water, and another of orange flower water. Strain it, and pour it into a glass or bason, or whatever else you please, and when it be cold, turn it out. Francatelli, Charles Elmé: “The Cook’s Guide” (1867). Francatelli was English, in spite of his name (he was of Italian parentage) and he was chef to Queen Victoria for some time. To six ounces of flour add ten ounces of sugar, a little salt, two ounces of butter, half a pint of strong coffee, and half a pint of cream; stir together briskly over the fire till it boils; then work in six yolks of eggs, and mix in lightly the whisked whites of nine eggs. Bake the soufflé as directed in No. 816. … i.e: in a soufflé dish, round which has been secured a high band of buttered paper, to prevent the batter from falling over the sides as it rises in the oven; place the soufflé on a baking-sheet in an oven of moderate heat, taking care to move it round occasionally so that it may receive the heat equally on all sides. Three quarters of an hour will suffice to bake a soufflé of this size; and if these directions are attended to, it should make its appearance on the dinner-table as high again as the soufflé-dish. To half a pound of sugar add a small cup of very strong coffee; boil to the snap, and then stir in a very little more coffee, and continue working the composition at the side of the pan with a wooden spoon for about five minutes, and as soon as it begins to thicken, pour it out upon an oiled baking-sheet, and allow it to be about the sixth of an inch thick; and when it becomes set – and before it cools, with the back of the blade of a knife, mark it out in oblong squares, measuring one inch by half an inch; when the bon-bons are quite cold, they will easily be snapped apart. Make a breakfast-cupful of strong, clear coffee; add half a pint of boiling cream to it; beat them well together; sweeten with two tablespoonfuls of sugar, and, when cool, add a small pinch of salt, the well beaten yolks of six eggs, and the whites of two. Stir the mixture over the fire for a few minutes, to thicken it, pour it into glasses, and serve with a little sifted sugar on the top of each glass. Probable cost, 1s. 6d for this quantity. Sufficient for six or eight persons. Mix a breakfastcupful of strong clear coffee with another one of boiling milk, six table-spoonfuls of finely-sifted sugar, and the yolks of six eggs. Stir the custard over a moderate fire until it thickens, then add a pint of thick cream. Stir it again over the fire till the cream coats the spoon, but do not let it boil. Pour it out, when cold, put it in a mould, and freeze in the usual way. Pour a pint of boiling milk through a muslin bag containing three ounces of freshly-ground coffee. Put one ounce and a half of soaked gelatine into a saucepan with a pint of cold milk, and inch of stick cinnamon, and two table-spoonfuls of sugar. Let it boil, and stir it until the gelatine is dissolved. Mix the yolks of two eggs with the coffee, strain the milk and gelatine upon it, pour it into a mould which has been immersed in cold water, and let it remain in a cool place until stiff. It will stiffen in about twenty-four hours. Probable cost, 1s. 3d. Sufficient for rather more than a quart of jelly. Presbyterian Cook Book: by The Ladies Of The First Presbyterian Church, Dayton, Ohio, (c1873). From the Feeding America Historic Cookbook Project. One cup of butter; one of sugr; one of molasses; one of raisins; one of cold coffee; three of flour; two eggs; a piece of citron, cut small; nutmet and cinnamon. Three cups brown sugar; one of butter; one of cold coffee; three eggs; three teaspoonfuls of soda; two of cinnamon; one of cloves; one of nutmeg; and three and one half cups of flour. Buckeye Cookery, And Practical Housekeeping: Compiled From Original Recipes. (1877); From the Feeding America Historic Cookbook Project. Two cups brown sugar, one of butter, one of molasses, one of strong coffee as prepared for the table, four eggs, one tea-spoon saleratus, two of cinnamon, two of cloves, one of grated nutmeg, pound raisins, one of currants, four cups flour. Mrs. Wm. Skinner, Battle Creek, Michigan. One cup brown sugar, cup molasses, half cup butter, cup strong coffee, one egg or yolks of two, four even cups flour, heaping teaspoon soda in the flour, table-spoon cinnamon, tea-spoon cloves, two pounds raisins, fourth pound citron. Soften the butter, beat with the sugar, add the egg, spices, molasses and coffee, then the flour, and lastly the fruit dredged with a little flour. Bake one hour in moderate oven or make two small loaves which will bake in a short time. Mrs. D Buxton. The Boston Cooking-School Cookbook; Fannie Merritt Farmer; (1896). From the Feeding America Historic Cookbook Project. ¼ cup butter; ½ cup sugar; ½ cup raisins seeded and cut in pieces; ½ cup molasses; ¼ cup boiled coffee; 2 eggs; 2 ½ cups flour; 3 teaspoons baking powder; ½ teaspoon salt; ½ teaspoon cinnamon; ½ teaspoon allspice; ½ nutmeg grated. 1 cup butter; 2 cups sugar; 4 eggs; 2 tablespoons molasses; 1 cup boiled coffee; 3 ¾ cups flour; 5 teaspoons baking powder; 1 teaspoon cinnamon; ½ teaspoon cloves; ½ teaspoon mace; ½ teaspoon allspice; ¾ cup raisins seeded and cut in pieces; ¾ cup currants; ¼ cup citron thinly sliced and cut in strips; 2 tablespoons brandy. The Neighborhood Cook Book Compiled Under The Auspices Of The Portland Section In 1912, Council Of Jewish Women. (1914). From the Feeding America Historic Cookbook Project. Cream a slice of butter one-half inch thick with one cup of sugar. Drop in two eggs, one at a time. Add one-half cup black coffee, one and one-half cups of flour, two teaspoons Crescent baking powder. Put in square pan, cover with chopped nuts, sugar, and cinnamon. Make some Genoese Pastry [see below], and bake in a greased sandwich tin for about three-quarters of an hour. When cold, split open and spread with the Coffee Cream. Ice the top with 4 oz. icing sugar, 1 teaspoon coffee essence, and 1 ½ tablespoons water, mixed together, and decorate any way liked. Make as for Pineapple Cream Filling [see below], using 1 oz. sugar and 1 teaspoonful coffee essence instead of the pineapple chunks and syrup. 1 oz. cornflour, ½ oz. sugar, 1 yolk egg, ½ pint milk, 1 tablespoonful cream, 1 teaspoonful pineapple syrup, 2 oz pineapple chunks cut fine. Mix the cornflour with a little of the milk, boil the remainder, pour this over the cornflour, return to the pan, and stir till boiling. Cook a little, add sugar, pineapple syrup, yolk of egg, and finely-cut pineapple, and cream. Use when cold. ¼ lb butter, ¼ lb flour, ¼ lb sugar, 2 eggs, ½ teaspoonful baking powder. Cream the butter and sugar together, add eggs and flour alternately, and lastly, add the baking powder. Bake the mixture slowly in a papered Swiss Roll tine for half an hour. When cold, cut in small pieces and decorate with any kind of icing. The cakes take their name from the icing used. Three quarters of a pint of strong coffee, a quarter of a pint of milk, three eggs, a quarter of a packet of gelatine, four or five ounces of sugar, salt, and vanilla. Put the made coffee with the milk, half the sugar, and the gelatine, into a double saucepan. Beat up the yolks of the eggs with the rest of the sugar and a pinch of salt, and stir this into the coffee. Whisk the whites of the eggs to a stiff froth. When the coffee mixture thickens, take it off the fire (it must not boil) and add the whites of the eggs and vanilla to taste. Pour into a wet mould and set aside to cool. Serve cold with whipped cream. Eggs, coffee, castor sugar, gelatine, and cream. Put into a basin the yolks of four eggs, and add to it a quarter of a pint of very strong coffee freshly made, then mix in from two or four ounces of sugar according to the taste. Heat this without letting it boil; let it get cold, and add to it the beaten whites of the four eggs, and a quarter of a pint of whipped cream. Serve it in glasses with petits fours. For decoration: Coffee glace icing [below]; chopped pistachios. Cream the butter and sugar, beat in the eggs with a little flour, and add the coffee essence with the rest of the flour and baking-powder. Pour into greased tins, and bake from fifteen to twenty minutes in a moderately hot oven. Ice when cold with coffee glacé icing, and decorate with chopped pistachios. Half-pound icing sugar; tepid water; flavouring. Sift the icing sugar, place it in a basin with the flavouring and enough water to make a coating consistency. Beat well and use at once. Note. – The water used for glace icing must not be hot, or the icing will lose its gloss. Other variations. – (a) The addition of coffee essence or other flavouring, the icing being named accordingly. (b) Rum Glacé icing. – Add rum in the proportion of one teaspoonful of rum to three-quarters of a pound icing sugar. (c) Orange Glacé. – Add grated orange rind and mix with orange juice. Add a very little carmine or orange colouring if necessary. Follow recipe for bread pudding [TOF: see below], substituting 1 ½ cups strong coffee for an equal quantity of milk, and omitting vanilla. 1 ½ cups bread crumbs; 3 cups hot milk; 2 beaten eggs; 2/3 cup sugar; ¼ teaspoon salt; 1 tablespoon fat; ½ teaspoon vanilla; ½ cup chopped nuts. Combine crumbs, milk, eggs, sugar, salt, and fat. Mix well. Add vanilla and nuts. Turn into a greased baking tin. Bake in a moderate oven (350oF) or until firm. Serve with whipped cream. Serves 6. Substitute 1 ½ cups coffee for milk in recipe for vanilla caramels [TOF: see below] and omit vanilla. 2 cups sugar; 1 cup brown sugar; 1 cup light corn sirup; 1 cup condensed milk; 1 ½ cups milk; 1/3 cup butter or fat; ¼ teaspoon salt; 1 ½ teaspoons vanilla. Cook sugar, corn sirup, condensed milk, and milk together in a saucepan, stirring constantly until the sugar is dissolved. Cook slowly, stirring occasionally to prevent burning, until the temperature is 248o f., or until mixture forms a firm ball when tested in cold water. Remove from the fire, add butter, salt, and vanilla, and mix well. Pour into a greased pan. When cold remove from pan, cut in cubes and wrap each caramel in waxed paper. 1 egg yolk; 1 cup evaporated milk; 1/3 cup minute tapioca; 2/3 cup sugar; ¼ teaspoon salt; 1 cup water; 2 cups strong coffee’ 1 egg white; 1 teaspoon vanilla. Mix egg yolk with small amount of milk in a saucepan. Add remaining milk, tapioca, sugar, salt, water, and coffee. Bring mixture to boil over direct heat, stirring constantly. Remove from fire. Beat egg white until just stiff enough to hold shape. Fold hot tapioca mixture gradually into egg-white. Cool. When slightly cool, stir in flavouring. Chill. Serve in parfait glasses with caramel sauce. Serves 8. Butter the inside of a granite saucepan. Add 2 ounces unsweetened chocolate and melt over hot water. Add 2 cups light brown sugar and mix well. Add 1 ounce butter and ½ cup rich milk. Cook until the mixture forms a soft ball in cold water, then take from fire, and flavor with vanilla. In the recipe for the Temple of Solomon in Flummery (which is the best word I've come across in a long time), I love how it makes it sound like everyone just has a "temple mould" lying around the kitchen. I use coffee not only in baking but as a braising liquid for roasting meat. It works especially well with ham.